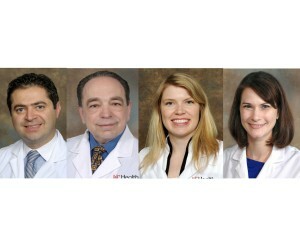 Waddell Center physicians, from left: Medical Director Aram Zabeti, MD, Lawrence Goldstick, MD, Michelle Bowman, MD, and Elizabeth Dragan, MD. The Waddell Center for Multiple Sclerosis at the University of Cincinnati (UC) Gardner Neuroscience Institute has in the past six months added four new physicians to its team of MS experts, bringing the total to five MS specialists. In addition, the Center has added a nurse practitioner, a social worker, and two new medical assistants in order to continue to strengthen MS care for residents of the Tristate and beyond. The MS team also includes specialists in neurology, urology, neuro-ophthalmology, neuropsychology, physical medicine and rehabilitation. In addition, the Waddell Center has also significantly expanded its clinical research and is now overseeing 21 clinical trials, with multiple new studies in the start-up phase. UC Health added three clinical trials coordinators in the new Dayton office, bringing the total number of clinical trials coordinators system-wide to five. One of the clinical trials includes the Cincinnati portion of the 28-site phase-2 clinical trial for ibudilast, an anti-inflammatory drug that is being tested in study participants with primary or secondary progressive MS, which is ongoing but not currently recruiting participants. Rehabilitation is an important component of comprehensive, quality healthcare for people with MS at all stages of the disease. The Waddell Center has re-energized its rehabilitation programs. In the past year, the Center added a physical medicine and rehabilitation specialist to the team, and more recently the Center received funding to expand classes for people with MS. This class started as a collaboration with the Ohio Valley Chapter of the National MS Society, and the Waddell Center will be continuing the Friday morning class at the Stetson Building, 260 Stetson Street in Cincinnati. Restorative yoga is a series of gentle poses and breathing techniques that emphasize alignment to benefits posture and balance; release tension so the body feels more energized; and teach relaxation techniques to reduce stress. This class is continuing at the UC Campus Recreation Center on Tuesday and Thursday mornings. Aquatherapy can enhance overall health while also reduce fatigue, improve balance, muscle flexibility and strength. The Waddell Center is one of 14 centers and programs within the UC Gardner Neuroscience Institute, a partnership of the UC College of Medicine and UC Health. To schedule an appointment at UC Health, please call (513) 475-8730. Dr. Bowman joined the Waddell Center team in September after completing her residency at UC and a fellowship at Ohio State University. She primarily practices at UC Health Physicians Office North in West Chester. Dr. DeSena did his fellowship in UT Southwestern Medical Center in Dallas and sees both adult and pediatric patients. He primarily practices at UC Health Physicians Office Clifton and Cincinnati Children’s Hospital Medical Center. Dr. Dragan joined the team this month from Baylor College of Medicine Maxine Mesinger Multiple Sclerosis Clinic in Houston. She practices in multiple locations, including UC Health Physicians Office Clifton, UC Health Physicians Office North in West Chester and the Hoxworth Building. Dr. Goldstick has 36 years of experience of treating patients with multiple sclerosis. He practices at the UC Neurology Clinic in Dayton. Ms. Parawira Clinical nurse practitioners are able to diagnose illnesses, order treatments and prescribe medications. She sees patients at UC Health Physicians Office Clifton and UC Health Physicians Office North in West Chester. This entry was posted in Articles and tagged MS, Multiple Sclerosis, UC Health, UC Neuroscience Institute, Waddell Center. Bookmark the permalink. Both comments and trackbacks are currently closed.